The cities of Garland and Rowlett will take an important step toward recovery this week as students return to class and debris cleanup begins. 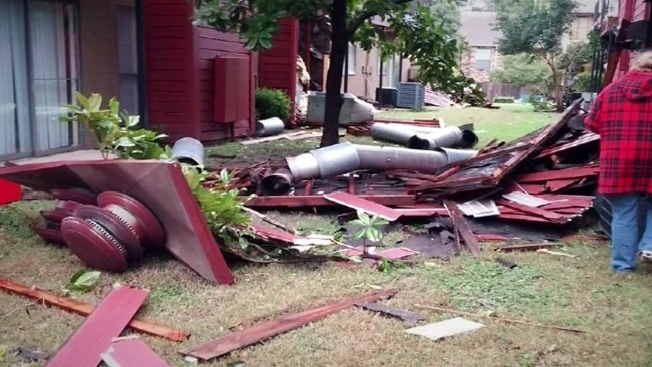 The City of Garland says tornado debris removal will begin Monday. Garland Mayor Douglas Athas joined NBC 5 News at 5 to talk about his city's recovery from a deadly tornado. True North Emergency Management will monitor and manage the removal of storm debris from public property and public right-of-ways. No commercial debris or hazardous waste will be removed by the city. The city says because of the area may receive major disaster declaration, the debris removal will be done by FEMA's guidelines so that it'll be eligible for FEMA reimbursement. This process will take about 10 weeks, with the first round of pickup expected to last about 3 to 4 weeks. Residents should not panic if they can’t have all their stuff ready for the first round. Residents must put their debris on the street curbline, contractors can’t come onto private property. The contractors are ONLY picking up storm-related debris, not household waste, etc. If the homeowner has engaged a contractor for demolition or repairs, that debris must be removed by the homeowner’s contractor, not the City’s. That’s a FEMA rule. The city asks that debris is placed outside of travel lanes and drainage ditches and away from obstacles such as mail boxes and fire hydrants. Texas Connects Us to the cleanup effort after deadly tornadoes. The focus this week is on helping the victims get their lives back together.